Hayes first baseman Laiha Slayton tags Dublin Coffman’s Anitra Herring-Starks during Tuesday’s non-league showdown in Delaware. 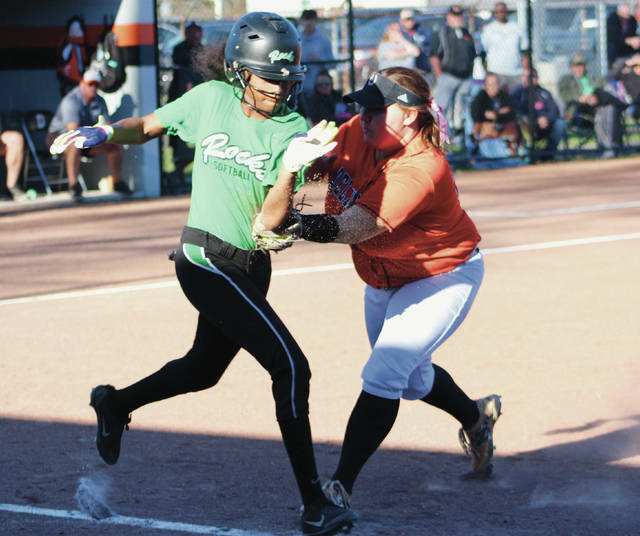 DELAWARE – Lexi Mattix woke up a sleeping offense with a two-run double in the fifth inning and the Delaware Hayes softball team scored six times in the sixth inning to overcome a deficit of four in an 8-4 win over Dublin Coffman in non-league play Tuesday. The Pacers banged out five hits over the final two innings in their come-from-behind effort. Mattix finished with two hits. She had a bunt hit in the third inning for Hayes’ second hit. Marley McDonald hit a three-run homer and Taylor Airy added an RBI single as the Shamrocks took a 4-0 lead in the first inning. Hayes pitcher Katie Fleshman surrendered three hits in the opening frame and as many the rest of the way to keep Hayes in things. But the bats were quiet. Haley Osborne grounded a ball up the middle with two outs in the second to get the Pacers in the hit column. Bobbi Adams legged out an infield hit deep in the hole between shortstop and third to lead off the fifth inning. Chloe Barton worked a walk to set up Mattix’s double, which hit off the top of the wall in left-center field with one out to finally get the Pacers on the board. Kami Slayton reached on an error to start the sixth. Laiha Slayton was hit by a pitch after an Osborne sacrifice bunt. Adams followed with a single to center to score Kami Slayton, cutting Coffman’s lead to 4-3. Adams finished with two hits to tie Mattix for the team lead. Barton worked a bases loaded walk to tie the game after pinch-hitter Makenna Campbell worked a walk to load the bases. Then, courtesy runner Abby Stephens scored on a wild pitch to give the Pacers (8-3) the lead. Alex Armstrong added a two-run single and Taylor Call drove in the final run on a squeeze bunt. Fleshman got a strikeout to end the fourth inning with a runner at third base after Airy doubled to lead off the inning and moved up on a sac bunt. Barton made a diving catch at short on a liner and doubled a runner off of third to end the fifth, keeping the deficit at 4-0. Fleshman went the distance to get the win for the Pacers. She allowed four runs, three earned, on six hits, three walks and a hit-batter and struck out seven. Lizzie Werth took the loss for the Rocks (5-8). She allowed six runs, five earned, on five hits, two walks and three hit-batters with six strikeouts. Sophia Maggs had a pair of hits, including a double, and walked once in three plate appearances to lead Coffman. Hayes returns to OCC-Cardinal play today, hosting Worthington Kilbourne at 5:15 p.m.